This man is the brother of Horace 1893 of Edlesborough, and you are welcome to compare the military history of the two men, as well as allow the two posts to share the same story of their family history. In the 1911 census, below, we can see that Henry was already 23 years old, and married. We can also see that the family had some skills: Mary 1889 and Charlotte 1897 are machinists, Horace 1893, Henry Charles and Henry’s wife Elizabeth work in a paper mill, and William Samuel 1894 is working for a blacksmith. Unfortunately, at only 46yrs old, Ellen is already a widow. We saw the marriage of John and Ellen in the story of Horace 1893, but John had died before he turned 40 years old. In comparison with his parents, whose marriage is pictured on Horace’s post, Henry could read and write, and so could Elizabeth. The Mary Tearle at their wedding was Mary 1889, Henry’s immediately younger sister. The best he could say for his job was “Labourer,” but he had a skilled job in a paper mill, at the heart of the printing industry. Unfortunately, these days there is no Card Finisher, and whatever it meant in 1911, it was given the code 811, which means Paper Manufacture – other. It is entirely likely that Horace, Henry and Elizabeth are all working at the same paper mill. 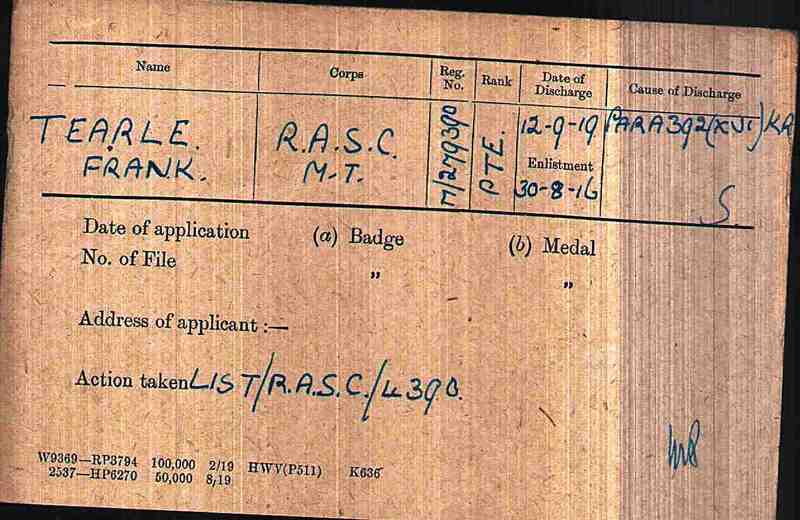 Henry went to the recruitment centre in Watford 24 May 1916 and signed up. On 9 Apr 1917 he was called up to the 3rd Infantry Works Company. He was 29 years 10 months old. He should have been in peak form. When he turned up at the testing centre in Bedford, they were not too sure. They gave him a Category Cii – a low medical grade – and they transferred him to the 327th Inf Wks Coy, with the regimental number 176875. They also filled out several forms for the purposes of opening records in his name – his wife, his family, his disabilities (none) his physical appearance and so on. 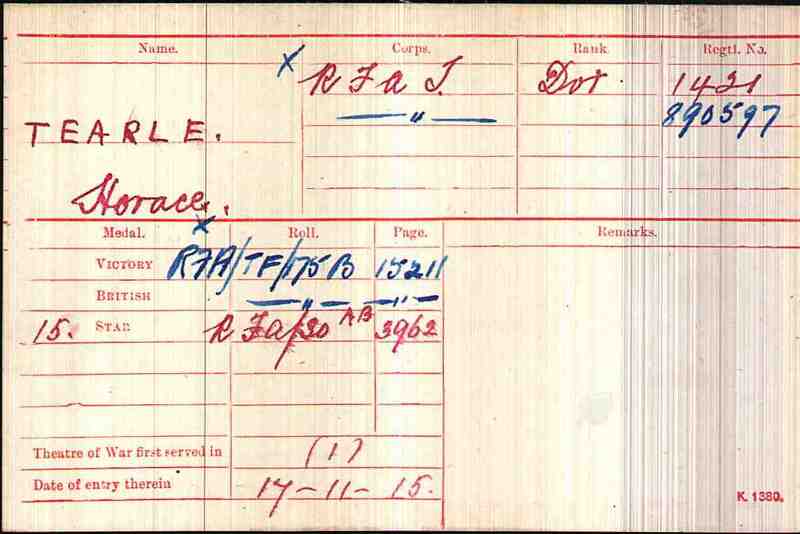 He was “Posted” to a duty unit on 24 April 1917. I can find nothing in his record that says he did anything or went anywhere, but that is true of any soldier’s record when he is serving at “Home” that is, anywhere in the UK, including Ireland. On 15 Feb 1919 he was transferred to the army reserve on Demobilisation. He was free to go home, but could be called up at any time if required. A highly satisfied form, I think, dated 7 Jan 1919 attested that on the matter of discipline “Certified no entry while serving in this Coy.” He had served in the war, and no-one had ever shot at him. He picked up the form from the No1 Dispersal Unit that allowed him to travel home, and noted that he was prohibited to wear army uniform after 28 days from 18 Jan 1919. He was allowed to wear his greatcoat, but if he handed it in at his local Post Office, they would give him £1 for it. He was free of the army, he could go back to his family and hopefully his old job, and he could tell a nice tale of his adventures. Horace fought in some of the bloodiest and most brutal battles of the Great War. Look at the names. Ypres (a town in Belgium, called Wipers by the soldiers who fought there) the Somme, a beautiful, gently rolling farming countryside in Pas-de-Calais, France where more than 19,000 men on the Allied side were killed on just the first day of the battle. These were vast killing fields where upwards of 500,000 men of both sides fought each other to a standstill and poured artillery fire and machinegun spite at each other in the hope that something they were doing would finally work, while their leaders tried to find an action that would finally break the deadlock. Horace joined early in the war, and survived. We know nothing about his wounds. You can see that John could not write, but Ellen Dyer could. 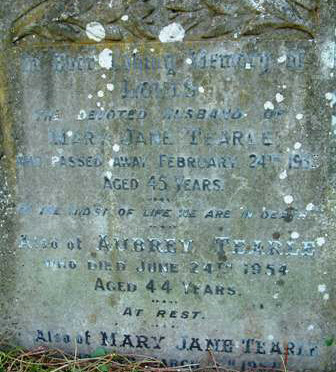 Ann Maria Tearle was John’s younger sister, and in 1885 she would marry the Arthur Rollings who had joined her as a witness at her brother’s wedding. 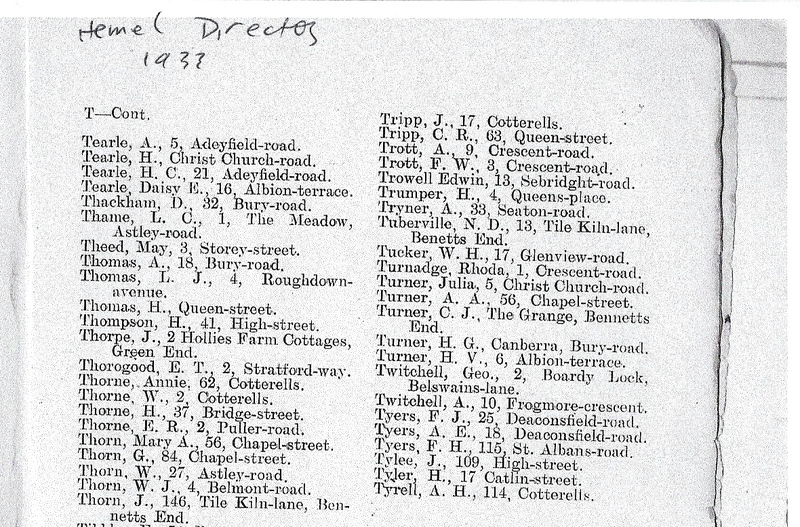 John’s parents were George Tearle 1831 of Eaton Bray, just a few hundred metres from Edlesborough. and Hannah Maria nee Janes. George’s parents were Jabez Tearle 1792 of Northall, a hundred metres across a field, and Mary nee Green. 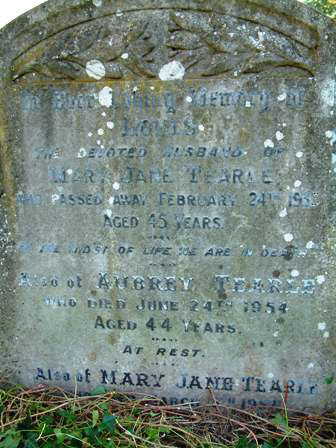 Jabez’ parents were William Tearle 1749 of Stanbridge and Mary nee Prentice. This means that Horace is on the branch of William 1749. 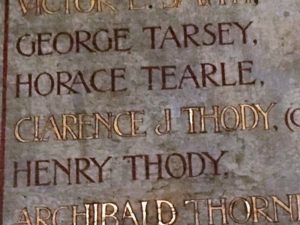 This branch has some of the most famous Tearle names ever, including Sir Godfrey Tearle the Shakespearean and movie actor, and a long and glorious tradition of military service. Horace was in very good company. His elder brother Henry Charles Tearle 1887 had joined the Royal Fusiliers, and his younger brother William Samuel Tearle 1894 had joined the Royal Field Artillery, although much later than Horace had. Henry and Horace had received written recognition of their efforts in the National Roll of the Great War, but for some reason, William Samuel had not. He would have received the medals, in the post, during 1922. The first name is probably Alexander Tearle 1898, the second is possibly Horace, the third is most likely Henry Charles 1887, but I do not know who Daisy E is. Horace died in Dacorum (the town of Hemel Hempstead lies in the district of Dacorum) in 1979, aged 85, and we hope that in the years after the Great War, Horace was able to piece together those parts of his character that make life worth living, for himself, and for his family. 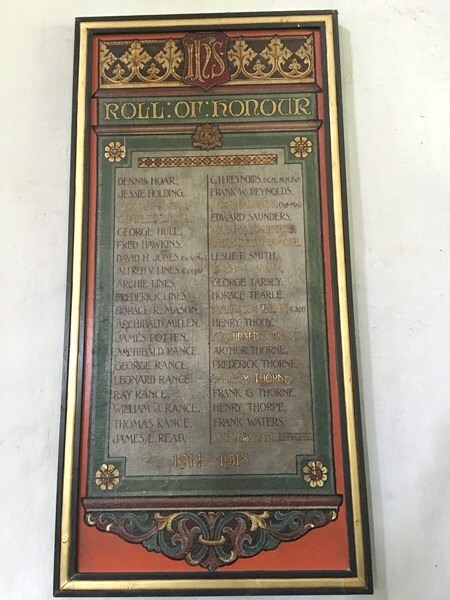 Studham Church Roll of Honour. We thank Paul and Edith Tearle of Studham for bringing this to our attention, and for taking us to the church to view this most touching of memorials. This is the headstone of Jane nee Draper, wife of Thomas born 30 Sept 1830 in Dagnall. This is another story of the grandchildren of Fanny Tearle. Her son, Abel 1797 of Edlesborough, married Hannah Frost of Tilsworth, near (very near) Stanbridge. Hannah died in 1839 and you can see Abel with his second wife, Ann Jones, living in Dagnall in the 1841 census. Abel and Hannah’s son Thomas b1830 in Dagnall, is not living with Abel and Ann because he is staying and working (Man Servant) at the house of Benjamin and Charlotte Johnson, farmer at Church End, Totternhoe. 1841 = Thomas 1830 (not born Beds) in the house of Benjamin Johnson in Totternhoe. This Benjamin Johnson (b1816) is Fanny’s son by her second husband, William Johnson of Northall. Benjamin went on to become a Morman and his family moved to Utah after his death. In 1848 Thomas married Jane Draper and this is how I first became interested in this family. 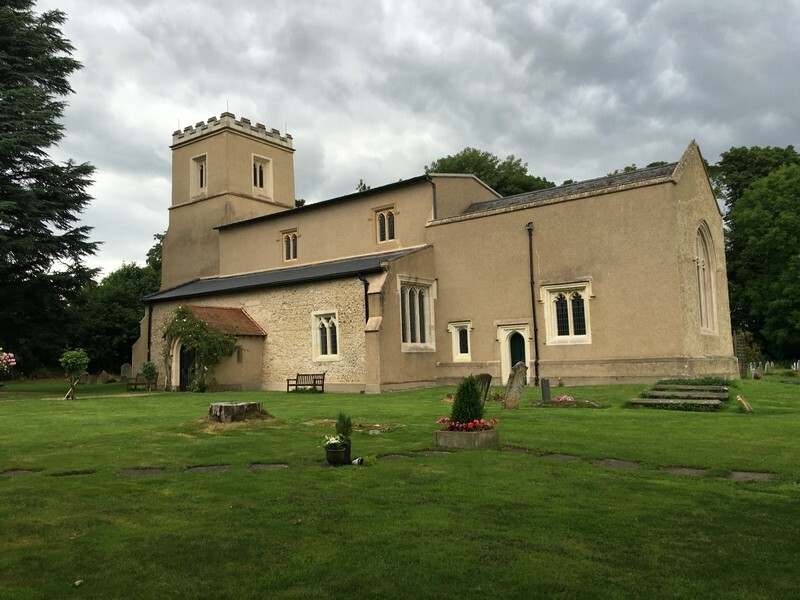 Elaine and I went to Edlesborough to have a look at St Mary’s, Edlesborough. 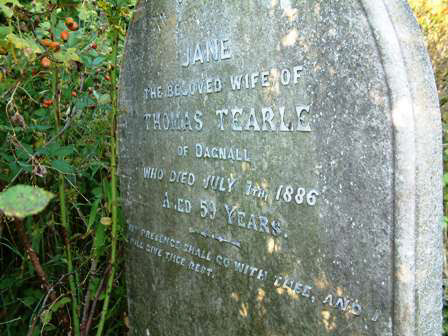 We found the headstone (above) for Jane, the beloved wife of Thomas Tearle of Dagnall, who died in 1886, at 59 years. We wondered who they were. Thomas must have been pretty successful, because a headstone was expensive, and one this size even more so. We were entranced by the deep love expressed by the memorial and the erudition of its sentiment. 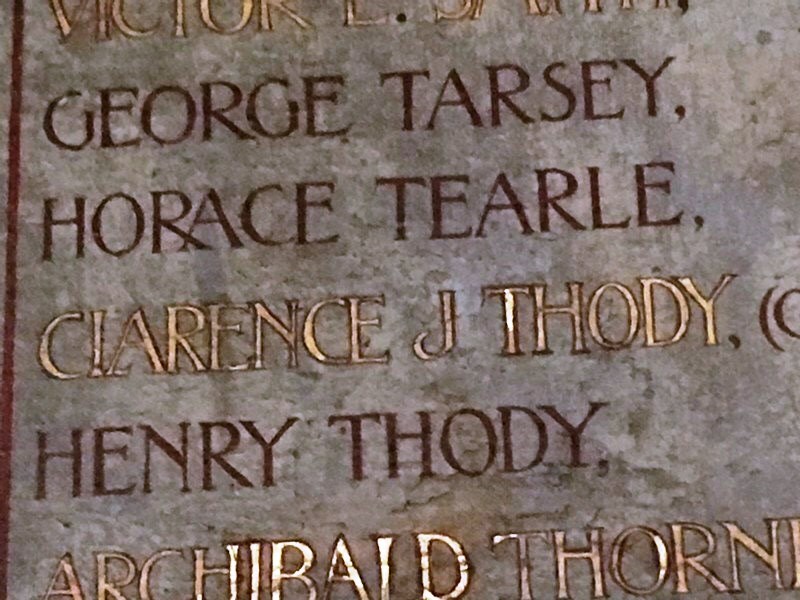 I found the story of Abel, Hannah and Ann, as well as Thomas and Jane, in the censuses from 1841 to 1901, and from them the connection of Thomas and Jane to the rest of the Tearle family. Thomas followed in Abel’s footsteps as a maltster; he was the head brewer for James Batchelar in Dagnall and must have been good at it. Calling himself Thomas Tearle of Dagnall is in itself a statement of self-confidence. The 1861 census is the best picture of this family and you can see that the names of the first three children – Susannah, Abel and Fanny – do help to add substance to the story that Fanny 1770 was a child of Thomas 1737 and Susannah nee Attwell. It would certainly suggest that this family was close to Thomas and Susannah. 1861 = Thomas 1830 Dagnall p1 Jane 34 Susan 12 Able 10 Fanny 7 Joseph 5 in Dagnall. Thomas married Bethia Smith from Pitstone (near Ivinghoe) in 1888 after Jane died. Thomas is buried with Bethia in Dunstable; I think the one at Priory Church, but possibly the Dunstable public – I haven’t found the memorial yet. I think that Thomas intended to be buried with Jane, hence the room left on the memorial, but events did not work out that way, it seems. It is also worth noting that Thomas is the brother of Susanna Tearle 1827. This headstone belongs to Peter Frank 1927 of Edlesbrough. He married Iris Patricia Galpin in Luton in 1948. His father was Frank 1898 of Eaton Bray who married Selina Gore in 1921. His grandfather was George 1861 Edles and his g-grandparents were George 1831 EB and Hannah Maria nee Janes. George’s parents were Jabez 1792 of Northall and Mary nee Green and that means Peter is on the branch William 1749 (and Mary nee Prentice). Frank was the brother of Jeffery 1891 EB who was killed in France in 1914. This makes Peter Jeffery’s nephew. I have uncovered the story of Louis Tearle. I have previously researched Jane Tearle, nee Draper, and now it was the turn of Louis. I started with this headstone: Louis, died 1935 aged 45, so born 1890, had a wife Mary Jane and a son Aubrey, born 1910. I started with the 1901 census and there Louis was, 11 years old, born in Eaton Bray, (EB) living next door to the Baptist Chapel (built 1835) in Edlesborough with father William 1853 Edles and his wife Ann 1852 Edles. William was a “cattleman on a farm” and the enumerator’s overseer added William to the generic group Ag Cattle. In the 1891 census for Eaton Bray, there he was, one year old, son of William 1853 Edles and Ann 1852 Edles as well as an older brother, Albert, 17yrs, so it would seem that William and Ann had been in Eaton Bray for at least 17 years. Both father and son were Agricultural Labourers while Ann supplemented the family income as a Straw Plaiter. I looked up the 1881 census for Eaton Bray and the family was there; William 1853 Edlesborough, Ann 1852 Edles, Albert 7, so 10 years younger, but there was a Louisa, aged 2. Well. This probably means that Louisa had died by 1891, and in trying to keep the name alive, William and Ann named their new boy Louis. I paused for thought and asked one of my colleagues at work. He didn’t think it was at all odd – names are often recycled, he said. Louis’ mother was Ann nee Bird and William his father was the first son of George 1831 of Eaton Bray and Hannah Maria nee Janes, who were married 13 Nov 1852 in Edlesborough. George was the son of Jabez 1792 of Northall and Mary nee Green. Jabez was the son of William 1749 of Stanbridge and Mary nee Prentice. Thus, Louis is of the branch William 1749. You will notice that Jeffery 1891, of the Dunstable WW1 memorial, and Louis share the same grandparents; Louis and Jeffery are first cousins. This is Jeffrey’s brother, Frank, born in Eaton Bray in 1898, son of George 1861 of Edlesborough and grandson of George 1831 of Eaton Bray and Hannah Maria nee Janes. The parents for George 1831 were Jabez 1792 and Mary nee Green and Jabez’ parents were William 1749 and Mary nee Prentice. You can see that it is woefully thin. He has served in the army from 3 Aug 1916 until 12 Sep 1919 and he gets no recognition at all. He will have been separated from his family for some time, on army duty, but because he was never posted overseas, all of this counts for nothing. Now, what I cannot do, is guess what his sickness was, but we know from this card that he was given a Para 392 discharge as “Not fit enough to be an efficient soldier.” He will have been sent to England, and possibly his own home, some time before 12 Sep 1919, because when it was determined that a Para 392 discharge was applicable, he would probably have been allowed to return to his own home, but still tied to army regulations until his discharge date. 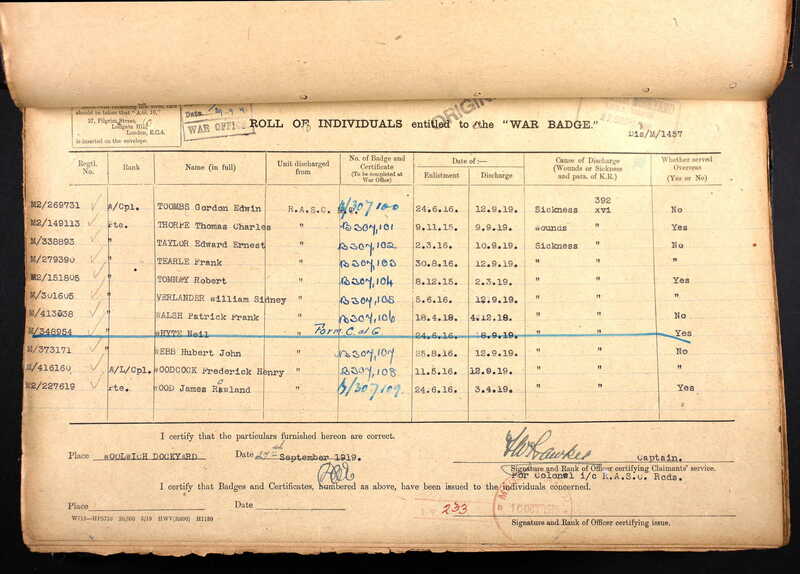 The central column in blue ink records the serial number of the War Badge that was awarded to him, and the right-most column reinforces the clear inference from his army medals card that he never served “overseas”. Ireland was counted as Home, not overseas, so it never counted as war service. 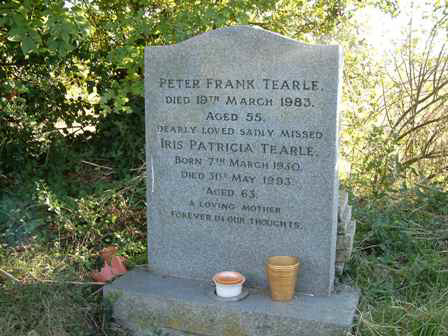 Frank married Selina Gore in 1921 and they are the parents of Peter Frank Tearle, whose headstone is in the graveyard of Edlesborough Church.